Issued June 17, 2003, to Inventec Corp. The ‘176 patent describes a computer-based growing simulation system used in role-playing games. Players can advance their characters automatically upon completion of certain objectives. Whenever a character fulfills the current objective, a number of points is awarded to him. With enough points the character is then progressed further in the game and upgraded. One goal of the invention is to not have a linear feel to it. Players can advance their character according to their own desires and do not have to follow a set path. In this free-roam game players move about on their own desires and complete the tasks that they want to so that the character is upgraded according to the wishes of the player, not by the computer. This free-roam style to the game also can create alternate endings since the game does not progress the same with every player. This should make the game more interesting for the RPG players. A computer-based growing simulation method and system is adaptable for a game and particularly a role playing game that reflects the growth of a selected role. In the game, the system will generate many different events such as simulated environments. Each simulated environment includes simulated lifelike objects (such as views or things) and conditions or selection items for the role to behave. Each condition or selection item links or relates to a selected object. The growth journeys are shown through the role’s progress in the game. The game does not progress in a fixed path or rounds format, but is determined by the behavior of the role in the game. The role’s growth status is indicated by a set of corresponding parameter groups. The parameter groups will change and accumulate according to the role’s growth journey. Variations of the parameter groups will reflect the player’s growth journey and feelings in the real world. The invention offers diversified game content to allow players to have lifelike participation experiences. 1. 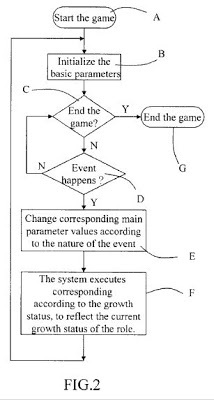 A computer-based growing simulation method for a role playing game implemented on a computer having a read and write recording medium for storing data executable by the computer, an output unit linked to the computer and an input unit linked to the computer to complete the game by executing the following steps: a. providing a role library which includes: data of plurality of different roles that are presentable in visual picture images on the output unit; and basic parameter groups corresponding to every role, the parameter groups including at least one parameter, and an age parameter for every role in the game; b. providing an event library which includes: data of a plurality of different simulated environments including simulated lifelike environment objects and things which are presentable in visual picture images on the output unit; and selection item groups for any one of the roles to show behaviors accordingly including at least one selection item, any selection item being related to a selected event in the event library, wherein triggering (selecting) a selection item will cause the computer to change a role’s basic parameter value in the corresponding event; c. providing a relation recording table for recording the relationship between every role and the events; d. displaying in a visualized fashion the role and the role’s behaviors corresponding to the events on the output unit; e. receiving signals or commands of devices operated by players through the input unit for changing the role’s behaviors or triggering a selected preceding event; and f. processing the corresponding events through the processing unit and sending processing results in visualized formats to the output unit.